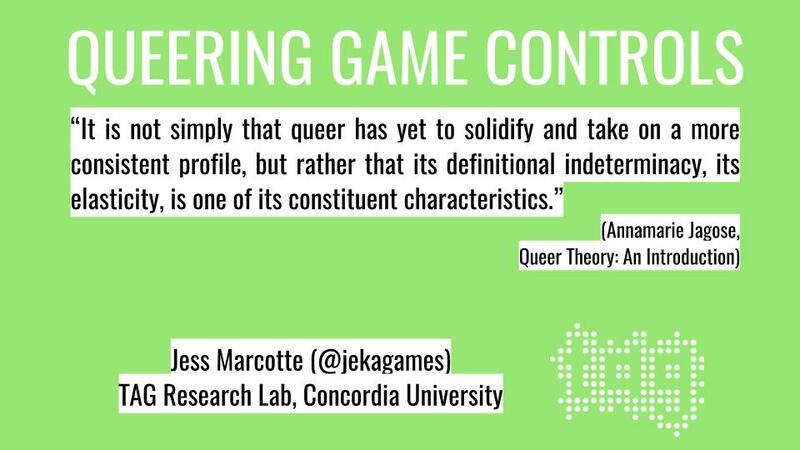 [I’m pleased to share that an article based on the research originally presented at CGSA 2017 has been published in a special issue of Game Studies about queer game studies. You can find the special issue here. You can find my article, entitled “Queering Control(lers) Through Reflective Game Design Practices” here. The research has developed quite a lot since this initial talk on the subject, so I highly recommend the Game Studies article rather than this post. Control literacy refers to the ability to pick up and play with a given controller, whether it’s a mouse, a joystick, the standard gamepad, a touchscreen or a touchpad, the frequently standardized keyboard key-controls , or any other set of learned conventions that are often assumed when it comes to game controls. Many of you will, for example, know exactly what I mean if I say something like, “the controls are just WASD (‘WHAZ-DEE’)”. This literacy quickly becomes invisible for those who have it, and is a part of what we mean when we say that someone is “good” at games or technology. For a detailed analysis of some standard game inputs, see Chapter 6 of Steve Swink’s Game Feel. But that raises a whole other discussion about heteronormative design, and I don’t think that we can yet call this particularly subversive, unless, for example, we were to repurpose it to play a different game. OK, so how are game creators, queer and otherwise, queering game controls? What are some examples of subversion related to these standards and best practices? In The Queer Art of Failure, Halberstam suggests, “Under certain circumstances failing, losing, forgetting, unmaking, undoing, unbecoming, not knowing may in fact offer more creative, more cooperative, more surprising ways of being in the world.” Queering design provides non-standard ways of creating as an alternative to the hegemonic best practices that govern the game industry. Queering can serve as both design philosophy and desired outcome for player experience. I’m going to talk about some games that I think demonstrate some strategies for queering games — not all the games are by queer designers, but they all subvert expectations around controls in ways that are useful touchstones for our discussion. Given time constraints, I’ve prioritized examples from my own practice and games by teams with queer creators. Why just any key? And what about the mouse? I had a build that included a mouse click to trigger the shots as well, but it quickly became obvious that that has too much implied directed agency (you click somewhere specific) which messes with the ‘involved and not involved’ feeling I want the game to have. The fact it’s any keypress (again, not, like the spacebar only to avoid the sense of having a specific agency, a trigger) makes your involvement both critical (it’s the only thing that makes the gun go off) and abstracted/distant. Why can’t you see the shooting? Well, you can – you see a flash in a window (or conceivably in an alley or a car, say), but you can’t see the people or the gun or ragdoll physics or any other details. That’s for two main reasons. The big one is I’m aiming for player interpretation and imagination within this highly constrained and minimalist interaction, so the less seen the better. The other one is that to the extent this game is ‘about’ shooting in games (and in life) I want to avoid any sense of ‘rewarding’ the action with visuals, physics, etc. In 2014, I made a short platformer game called “Seventy-Eight” with Allison Cole and Myriam Obin. The title is a reference to the difference (at the time, and not accounting for intersectional identities) in pay between men and women — for every dollar a man made, a woman could expect to make seventy-eight cents. In this game, you play a woman who can’t seem to please the system. Made in a weekend at the GAMERella game jam, the game features audio recordings of gendered insults that we asked other jammers to record, based on what they might expect to hear aimed at a woman who was considered to be underperforming, a woman who was considered to be performing at a normal level, and a woman who was thought to be overperforming. The appropriate audio plays when the character is at the bottom of the screen (underperforming), the center (performing adequately), and at the top of the screen (overperforming). The character is damaged if they are either too much to the bottom of the screen or too high up. In programming this game, I created phantom key presses and invisible changes to the platforms that would cause the avatar to jump or walk without player input, as well as making platforms lose their collision detection boxes at random, causing the avatar to fall through. These were deliberate choices that were meant to make the game feel systemically unfair, but they read so subtly that they felt like glitches or mistakes. These were meant to procedurally represent the invisible forces of systemic oppression that might trip people up in the workplace. The intent was to create a feeling of paranoia in the players causing them to wonder whether or not the system was against them or if their own performance was inadequate. Such feelings of not knowing are common to the experience of marginalized people. But ultimately, despite the careful theming, there was no way for players to know about these programmatically enforced rules related to the controls without being told. The result was that players expressed frustration because they didn’t know that this was happening. In Robert Yang’s “Hurt Me Plenty,” the player takes on the role of a Dominant negotiating boundaries with a partner who they are about to spank. The player negotiates how hard they will spank their partner, what clothes the submissive will wear for the spanking, and a safeword. The game randomizes the title that the player’s partner uses for them. If the player violates their partner’s boundaries in the game, the game can lock the player out for hours at a time, potentially days, depending how seriously boundaries have been violated. This means that if the game is being showcased at a festival, and one player violates these boundaries, all the festival-goers can be locked out for hours. As Yang notes “Your trust, safety and politics affects the entire community” (Indie Tech Talk #23 Cheeky Design, NYU Game Innovation Lab 2014). This denial is powerful because players are used to being catered to and to being in control. The controllers for this game are comprised of PlayStation Move controllers, a Makey-Makey, and a pair of hand-sewn conductive sleeves. In Tune uses consensual touch as one of the main mechanics of the game. With a partner, players are asked to examine a physical pose modeled on a screen by two artist’s mannequins. Players then discuss whether they wish to complete the pose, and if they do, how they will do so. The game is focused on negotiation of boundaries, and as such, it is possible to decide to modify a pose to make it more comfortable for those playing. This is one reason why during the development we thought about and discarded the idea of using something like the Kinect. The accuracy of the poses isn’t as important to us as the negotiation. Should players decide not to complete a particular pose, they simply skip it, and are presented with a new one. If they decide to complete the pose, they hold it for 13.5 seconds, enabling them to consider the experience without turning the game into a problematic version of “chicken.” If players interact while one player is not consenting (a state that they signal through a button on the PlayStation Move), the game provides audio feedback in the form of radio static, vibrating controllers, and bright red lights at the tip of the Move. After a pose is completed, players are presented with a prompt that is intended to help them to reflect on the experience or deepen their relationship with their partner. Such a prompt might, for example, ask players to recommend media to one another, do their best chicken impersonation, or name something that the other player has done well during the last interaction. The poses are not ranked in any way, and the same pose can appear twice. This allows for people’s different personal histories with intimacy, and also allows for people to reconsider the same pose. They might have said yes to a pose, and decide the next time that this wasn’t a comfortable experience for them, and so say no this time. On the other hand, they may not have felt comfortable with a pose when it was first presented and skipped it, but after getting to know the game and their partner, they may wish to say yes the next time they see it. Some poses are also deliberately challenging for a number of logistical reasons, encouraging players to say no for reasons other than just the relative intimacy of the pose. Power dynamics are also included as a factor, with some poses mimicking power exchanges. As the human touches the cup and the plant’s surface, a soundscape begins to play, layering itself and fading in and out according to the conductance between the plant and the human. The relationship that is built by this experience is partially fictionalized: the instructions for the game have dating profiles for each plant, suggesting what kinds of touches and other interactions the plant partner might enjoy, and the instruction manual also contains a section explaining that the plant is playing an ASMR soundscape back to the human in the hopes that it is something that they will enjoy. The Plant ASMR that results was written and performed by Dietrich Squinkifer and myself, designers trying to think like plants trying to appeal to humans. Fictionally, the plants also enjoy this relationship — we can’t access the consciousness of these plants to determine whether or not they enjoy being touched, although there are number of articles that have come out recently talking about plants and their sensory organs, such as a BBC Earth article that came out just before this game was made entitled, “Plants Can See, Hear, Smell and Respond.” Still other research by Dr. James Cahill (University of Alberta) talks about how some plants may benefit from or “enjoy” being touched, while others are harmed by it. So, we can’t know for sure about these particular plants. This is part of the fiction of the game. On the other hand, the conductance, and therefore each plant’s personality, is based on the plant’s physical properties as well as the physical properties of the human player. Touching the plant in different places, with different degrees of pressure or different types of touches varies the soundscape, and humans themselves offer different skin conductance based on the dryness of their skin. These properties are not engineered, and the feeling of the human touching the plant’s skin is not made up. These physical properties form the unique character of the relationship between each plant and human, and I think the feeling of being connected to another living creature, even if it is mediated, is sincere. You may have had the chance to play this game yesterday at lunch. The Truly Terrific Traveling Troubleshooter is a radically-soft game about emotional labour and otherness that fits entirely inside of a carry-on suitcase. One player takes on the role of the Troubleshooter and the other is a Customer with a trouble. Assisted by the Troubleshooter’s toolkit, the SUITCASE (Suitcase Unit Intended to Cure All Sorts of Emotions), the players work together to find a solution to this problem by following a series of steps. At the end of the encounter, the Customer decides whether or not the terms of their agreement with the Troubleshooter have been fulfilled, and whether the Troubleshooter has earned their payment — a coupon upon which a method of payment is represented. *The status quo quickly becomes invisible or normalized. *Game controls require a literacy that not everyone may have. *We can create controls that destabilize standard control literacies. *There are other interesting states and effects that game designers can aim for besides the flow state. *Players are used to being powerful in mainstream games, but playing with that agency and that power can be generative. *Making the invisible visible again, or even hypervisible, can be a generative design exercise. * One audience member talked about a friend who loved the idea of LARPing intimacy, but because of experiences in their background, was not down with the physicality involved. We briefly discussed ways of including intimate content/intimacy related content in LARPs without players having to act out these sequences, such as the fade-to-black technique, Ars Amandi, and countless others. * This led to a discussion of some creators’ frustration with the notion of “empathy games,” which are sometimes assumed to be created for people who do not have that marginalization to “learn what it’s like” to be marginalized in that way, but a short experience like a game cannot stand in for years of life experience. And, furthermore, marginalized creators are unlikely to be creating their games for the sole sake of educating someone else. * Another audience member brought up the importance of documentation for alternative game controllers such as video, since the controllers themselves are so often hard to access. * In response to the design exercise I introduced at the beginning of the talk, an audience member brought up the idea of trying to make a game that, the better you did by standard metrics, the worse you would do in the game. This also brought the idea of doing well at doing objectionable things, like in Lucas Pope’s Papers, Please, or like in Brenda Romero’s Train. Anthropy, A. (2012). Rise of the Video Game Zinesters. 1st ed. Seven Stories Press. Barr, P. and Khaled, R. (2015a). A series of gunshots [game]., Pippin Barr, Montreal, Canada. Halberstam, J. (2011). The queer art of failure. 1st ed. Durham: Duke University Press. Jagose, A. (1996). Queer theory. 1st ed. New York: New York University Press. Khaled, R. (forthcoming). ‘Questions over Answers: Reflective Game Design’, in D. Cermak-Sassenrath, C. Walker & T. T. Chek (eds) Playful Subversions of Technoculture: New Directions in Creative, Interactive and Entertainment Technologies, Springer, Berlin, Germany. Csikszentmihalyi, M. (1990). Flow: The Psychology of Optimal Experience. Harper & Row. Olou, R., Pacampara, N. & Phillips, H. (2015). We Are Fine, We’ll Be Fine. Critical Hit Montreal, Montreal, Canada. Schrank, B. and Bolter, J. (2014). Avant-garde videogames. 1st ed. Cambridge, Mass. : MIT Press. Shinkle, E. (2008). Video games, emotion and the six senses. Media, Culture & Society, 30(6), pp.907-915. Swink, S. (2009). Game feel. 1st ed. Amsterdam: Morgan Kaufmann Publishers/Elsevier. Yang, R. (2014). Hurt Me Plenty [game]., Robert Yang, NYC, USA.